The MP1584 is a high frequency step-down switching regulator with an integrated internal high-side high voltage power MOSFET. It provides 3A output with current mode control for fast loop response and easy compensation. The wide 4.5V to 28V input range accommodates a variety of step-down applications, including those in an automotive input environment. A 100µA operational quiescent current allows use in battery-powered applications. High power conversion efficiency over a wide load range is achieved by scaling down the switching frequency at light load condition to reduce the switching and gate driving losses. The frequency foldback helps prevent inductor current runaway during startup and thermal shutdown provides reliable, fault tolerant operation. 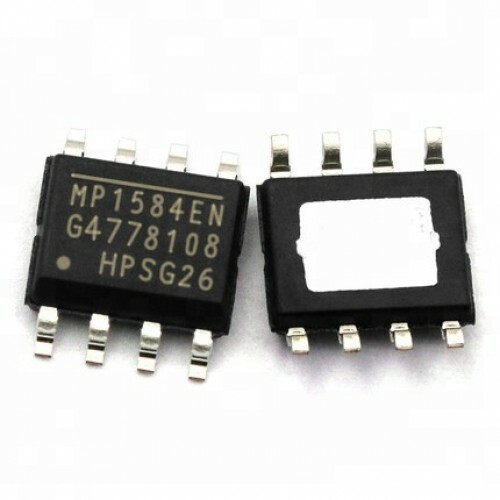 By switching at 1.5MHz, the MP1584 is able to prevent EMI (Electromagnetic Interference) noise problems, such as those found in AM radio and ADSL applications. The MP1584 is available in a thermally enhanced SOIC8E package.